I don’t know if you like reading things that are different from your normal reading and that allow your mind to rest a while. For me this is usually night-stand reading. I like western Americana and adventure, and I have reported before on Zane Grey, Louis L’Armour, John Fox, Jr., and Harold Bell Wright (even on Charles Portis’ original True Grit). 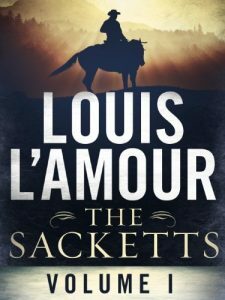 My son-in-law Aron has a huge collection of L’Amour so last time I was in Alaska I “borrowed” the first two books in L’Amour’s Sackett series (16 in all) and read them both quickly. I liked them. They are quick moving, more adventure than personal relationships (i.e., there isn’t always a girl in the story), and they are quite historic of America’s founding. Louis Dearborn L’Amour (1908-1988) was an interesting American figure of the twentieth century. Born and raised to a French family in the American west (Jamestown, North Dakota), L’Amour lived a varied and interesting life until he became a successful writer. Besides working in saw mills and lumber camps as a boy, he was a mine assessment worker, a professional boxer, and a merchant seaman. During WWII he served as a Lieutenant with the 3622nd Quartermaster Truck Company in Europe. His western novels caught on in the 1950s with one, The Gift of Cochise, made into a movie starring John Wayne. He was also an early pioneer in audio books, called “single voice style,” for Bantam Audio Publishing. From there until his death by cancer in 1988 L’Amour wrote 105 books. In 1982 he received the Congressional Gold Medal, and in 1984 President Ronald Reagan awarded L’Amour the Presidential Medal of Freedom. He is buried with distinction in Forest Lawn Cemetery in Los Angeles.